How to Connect Desktop Remotely in Windows 10? Remote Desktop Connection (RDC) is a technology that permits a computer to connect, gain access and take control of a remote PC over a network. It implements Remote Desktop Protocol (RDP) through Terminal service or Remote Desktop Service to gain remote access over a computer or a network. Remote Desktop Connection Broker: This tries to maintain an uninterrupted connection with remote desktops. It allows the user to reestablish the connection if there exists any interruption without losing the view of a virtual desktop. Remote Desktop Gateway: This component establishes connection to RemoteApp programs and virtual desktops over the Internet. Remote Desktop Licensing: This helps to track the usage of license while deploying RDS. Remote Desktop Session Host: The Session Host entitles a server to host session-associated RemoteApp programs or desktops. Remote Desktop Virtualization Host: This is the component entitles to host virtual desktops. 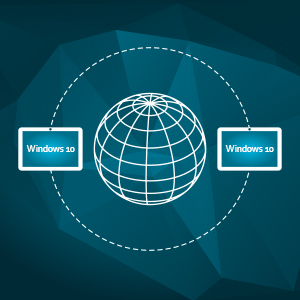 Remote Desktop Web Access: This component lets establishes access connection to RemoteApp or remote desktops programs through Start Menu or Web browser. How do I enable and set up a remote desktop connection in Windows 10? Enable Remote Desktop on the system that you want to work from remote. Click the Start, right-click on Computer, and select Properties. Under Properties, select the Remote tab. Enter the administrator password here. Once an option is selected, click the Select Users button. If you are an administrator already on the system, then the current user account is added to the list of remote users by default. If not, you will need to do the following steps. Click Add in the Remote Desktop Users dialog box if you want to add a user account to the remote users list. Complete one of the following tasks in the Select Users or Groups dialog box a) Click Locations, and then choose the location you want to search; b) Enter the username by clicking the Enter the object names to select, and then click OK. By this way the username is added to the list. Click OK to complete the process. Enter "Remote Desktop Connection" in the search box, and then click Remote Desktop Connection from the list. Type in the name of the computer in the Computer box, that has to be connected and click Connect. Does Guide For Remote Desktop Connection in Windows 10 is helpful?